Irrational faith in corporate R&D is not science, it is a modern day cult built on old, shameless tricks. February 26, 2015 (Tony Cartalucci - LocalOrg) - When money and power are involved, those standing to gain the most will say and do anything to push their agenda forward. Five centuries ago, saying and doing anything involved exploiting people's superstitions and their faith in religion. Today, saying and doing anything means also exploiting science. Science, engineering, and design are amongst our most practical and effective tools to make real and meaningful change. But because they are so powerful and appealing, the potential for their abuse in the wrong hands is immense. Compounding this is the naivety of those who are fascinated by science's promise but blind to its potential abuse. It wasn't long ago when big-tobacco had armies of "scientists" citing the latest "studies" confirming the health benefits and safety of smoking. Of course these were paid liars, not scientists, even if many of them had PhDs. And it was lies they were telling, even if mixed with shades of science. Today, special interests have refined this practice of filtering lies and exploitation through the lens of science regarding everything from genetically modified organisms (GMOs) to the false debate on climate change, to the questionable interests behind global vaccination programs. We live in an age when all manner of scientific knowledge—from the safety of fluoride and vaccines to the reality of climate change—faces organized and often furious opposition. Empowered by their own sources of information and their own interpretations of research, doubters have declared war on the consensus of experts. Indeed, just as religions claimed a monopoly on morality and spirituality, National Geographic condemns those "empowered by their own sources of information" and "their own interpretations of research," maintaining that the only truth to be found is amongst the "consensus of experts." National Geographic never explains why "organizations funded in part by the fossil fuel industry" are conspiring to lie, but the notion that "scientists" would conspire to lie is "laughable." After all, scientists work under various organizations funded by special interests as well, including immense corporate-financier interests - many of which overlap with big-oil, ironically. If the billions to be made by big-oil is motivation enough to lie and say the Earth isn't getting warmer, aren't the billions to be made in a "carbon credit" pyramid scheme also motivation enough to lie that it is? Images: The "science" of smoking. 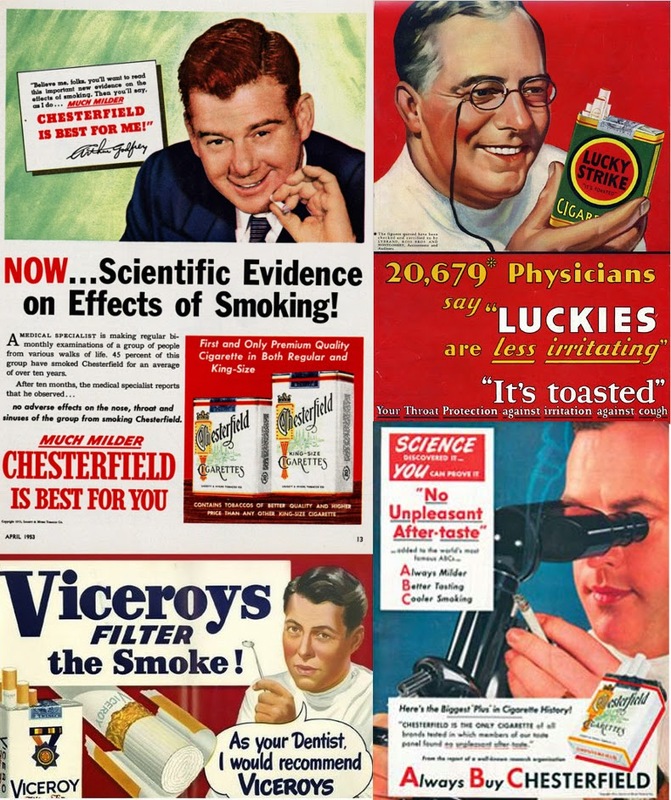 Images collected by the New York Times for their article, "When Doctors, and Even Santa, Endorsed Tobacco" depict "scientific studies" assuring consumers of the safety, even benefits of smoking cigarettes commonsense told everyone else were literally killing people. Those today who think they are ahead of everyone else by parroting "scientific studies" regarding big-ag's GMOs, big-pharma's vaccines, and big-oil and bankers' climate change racket are ahead of nothing. They are being duped by an old trick practiced shamelessly for at least 100 years. 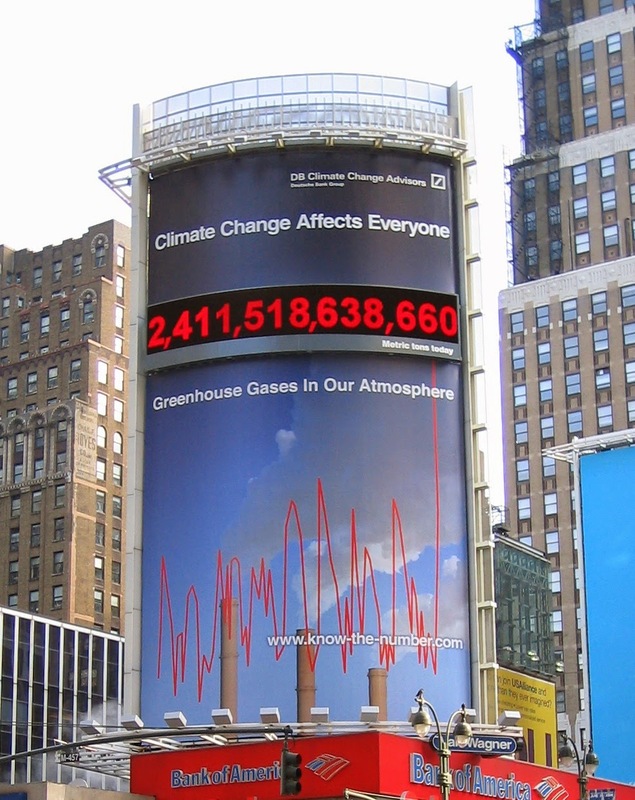 A truly scientific examination of the facts would reveal that the climate always changes - that humans are most likely impacting the climate since virtually everything else does - but that also both big-oil and big-business possess enough money to buyout both sides of the climate change debate, and profit from it without actually truly understanding the climate or what humanity can do to adjust to it no matter what it does or why. ...evolution actually happened. Biology is incomprehensible without it. There aren’t really two sides to all these issues. Climate change is happening. Vaccines really do save lives. Being right does matter—and the science tribe has a long track record of getting things right in the end. Modern society is built on things it got right. Evolution does happen. Biology is incomprehensible without it. The climate does change. The science of vaccines is sound. The problem that most people have with each of these topics is not honestly addressed by National Geographic. The article puts up strawmen arguments to make anyone questioning the established narrative appear exceptionally irrational, even dangerous. Few if anyone seriously questions the theory of evolution. The moon landings are also mentioned in the article, but also are included for the sole purpose of making people questioning the matters of GMO, climate change, and vaccines seem more unreasonable and fanatical. Besides appealing to mainstream "experts," the article doesn't actually address the arguments for or against each of the three latter topics. The article is essentially a long winded hit piece on people questioning the establishment and what it claims science is telling us about each of these three points of contention. It is essentially a warning against "heresy." The few hints included in the article however, reflecting the talking points of big-government, big-business, and big-academia, are easily dismantled with the skeptics' arguments conveniently excluded from the article. It is true. Traditional breeding has altered the genetic constitution of plants and animals we consume daily. So drastically have we altered many of the grains we consume over the centuries, many people cannot even consume them because of gluten intolerance. Nature too alters genes through mutations and natural selection. These genetic changes can lead some species to success, and in other cases, these genetic changes can lead an entire species toward extinction. In some drastic examples, these genetic changes can lead entire ecosystems into extinction - the greatest example being the Great Oxygenation Event (one of several mass extinction events in Earth's natural history) in which cyanobacterial filled the Earth's atmosphere with oxygen, killing off most of the planet's anaerobic inhabitants. If nature can lead itself off such catastrophic cliffs with natural genetic mutations, and traditional breeding has altered our food to the point it is not edible to some, what might humans altering DNA inside organisms lead to? Biotechnology cannot be uninvented. While it shouldn't be feared, it should be respected. It should be understood by the greatest number of people across the widest possible social strata. The democratization of this technology means the unlocking of its potential for the greatest possible good for the greatest possible number of people, controlled by the very people who will directly benefit from it. Until then, skepticism regarding products peddled by immense corporate monopolies jealously hording this technology caught time and time again infiltrating government regulatory bodies and running stables of "scientists" and "researchers" churning out "peer reviewed studies" sponsored by the very producers of the subject at hand is not "irrational" nor constitutes a distaste for science, but rather is simple, cautious commonsense. Commonsense also tells us that rolling up our sleeve and allowing ourselves to be injected by a substance produced by literal criminals is a demonstration of unhinged, absolute insanity. Indeed, the manufacturers of vaccines are criminals, literally. 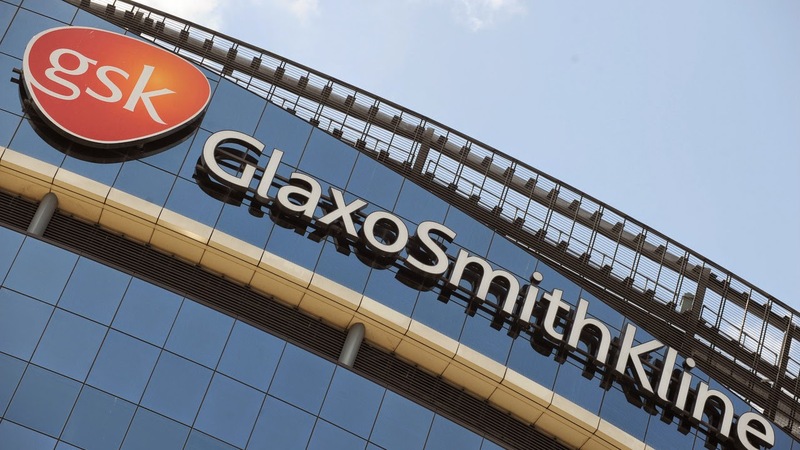 One example is GlaxoSmithKline (GSK), an immense pharmaceutical giant based in the UK. It has been caught on at least 3 separate continents engaged in a multi-billion dollar bribery racket. In China when the police began investigating the systemic corruption driving GSK's sales in Asia, GSK attempted to bribe the police as well. According to the official, the company’s China subsidiary set up several internal units with code names like “operation Great Wall” and “operation soaring dragon” specifically to bribe doctors and government officials. He also said that in 2012, as the company came under scrutiny from the authorities, Mr Reilly and two Chinese subordinates established a “crisis management team” to bribe law enforcement officers from China’s industrial and commercial administration. The goal was to convince them to stop an investigation into the company’s illegal activity, the official said. The pharmaceutical giant has been caught in Europe, the Middle East, and the US in similar bribery rackets of equal immensity. GSK also manufactures vaccines for diseases including hepatitis, rotavirus and HPV infections, diphtheria, tetanus, whooping cough, measles, mumps, rubella, bacterial meningitis, and influenza. The question of whether or not properly manufactured vaccines can guard against the above mentioned diseases isn't the question, the question is why would anyone trust their health and life to a corporation engaged in global-spanning criminality? But GSK's bribery scandals and the fact that virtually all other mega-pharmaceutical corporations are engaged in similar practices isn't the worst of it. 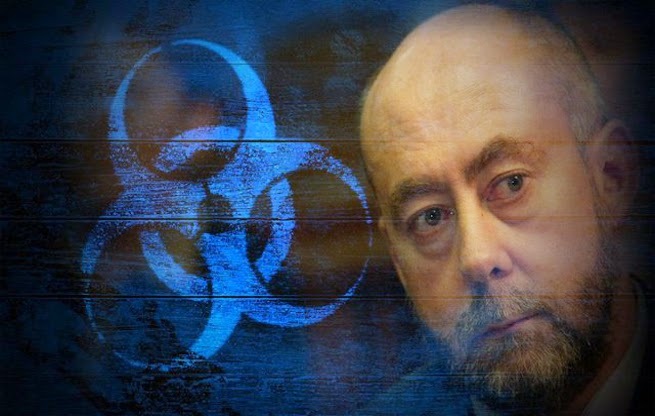 In contrast to the conviction of Mr de Kock stands the bizarre case of Wouter Basson (pictured), a medical doctor who ran the apartheid government’s chemical and biological warfare programme. Nicknamed “Dr Death” by newspapers, he was granted immunity for many crimes because they allegedly took place outside South Africa. As Dr Death he allegedly provided cyanide capsules to soldiers, and tried to develop bacteria that would selectively kill black people, as well as vaccines to make black women infertile. One example of this interaction involved anti-fertility work. According to documents from RRL [Roodeplaat Research Laboratories], the facility had a number of registered projects aimed at developing an anti-fertility vaccine. This was a personal project of the first managing director of RRL, Dr Daniel Goosen. Goosen, who had done research into embryo transplants, told the TRC that he and Basson had discussed the possibility of developing an anti-fertility vaccine which could be selectively administered—without the knowledge of the recipient. The intention, he said, was to administer it to black South African women without their knowledge. black communities. They were to be given to victims without their knowledge. One wonders what sort of lies the South African media would have invented, when black women began to realize the vaccines were in fact a weapon aimed at them and their communities and began warning others not to take them. Would terms like "anti-vaxxers" have been invented, and parades of "scientists" rolled out to assure South Africans that vaccines were perfectly safe and those refusing to take them were dangerously ignorant? Would South Africa's version of National Geographic have claimed such people were simply being irrational in the face of the unquestionable reasoning of science? Why is National Geographic now calling people "irrational" for being suspicious of vaccines when they are created by criminal corporations and when there are recent examples of governments using vaccines as weapons against their own people? It might also trouble readers to know that South Africa's repressive, racist, genocidal regime at the time received significant support from the United States and many European nations. This included both political support and significant military aid. Considering all of this, it would seem rather unreasonable to trust "the experts." As with GMOs, studies underwriting the safety and necessity of these vaccines are also subject to immense lobbying efforts and outright corruption and criminality. Efforts to vaccinate the entire population of the planet (7 billion and counting) with a growing number of vaccines, including boosters for those who have already received them, is worth billions upon billions. Trusting "scientists" without considering the possibility this immense fortune might skew their objectivity is folly. It is just as dangerous to be ignorant of the human condition and its corruptibility as it is to be ignorant of scientific facts regarding diseases and the benefits of vaccines. What is the truth behind the science of vaccines? They work. They may or may not be necessary in nations whose populations have access to proper nutrition along with modern sanitation and hygiene practices. If vaccines are to be distributed, they should be manufactured and administered by interests outside of government and corporate entities, both of whom have proven beyond doubt they cannot be trusted with such a responsibility. Everything from the sun, to geological processes, to constantly evolving ecosystems have an impact on the climate. There is no "normal" climate we must attempt to maintain. Millions of years before human civilization, CO2 levels and temperatures were many times higher than what they are now. 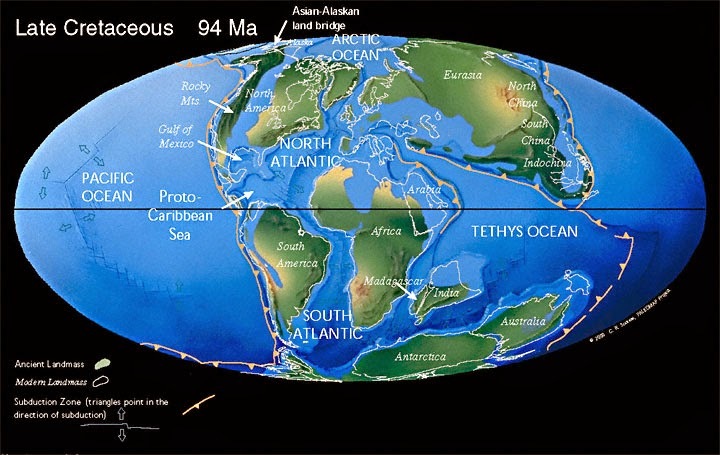 During the Cretaceous period there were no ice caps and the continent of Antarctica was covered with lush temperate forests inhabited by dinosaurs. Image: The future after anthropogenic climate change causes sea levels to rise? No, this is the Earth tens of millions of years ago when CO2 levels were 15 times higher than they are today and Antarctica was covered in temperate forests filled with dinosaurs. Climate change is going to happen with or without humanity, and instead of working on policy, we should be working on technology that will help us minimize our impact on the Earth (and our own health) and 'weather' the weather, no matter what it does or why. Humanity itself has seen wild fluctuations in the climate, enduring an ice age and an exceptionally warm period during Medieval times. The fact that the climate of the planet naturally changes, however, does not absolve humans from minimizing their impact on the planet. Beyond ending the reckless genetic contamination of the planet's genetic heritage through the use of GMOs, the petrochemical industry and the heavily centralized consumerist paradigm that currently exists must also be dismantled, decentralized, and converted to more sustainable and healthier alternatives, not only for the planet, but for society and human beings individually. Image: Deutsche Bank's "CO2 Clock" meant to leverage people's fear of anthropogenic climate change directly into billions via a "carbon credit" pyramid scheme. While big-oil makes billions off of petrochemicals destroying the environment and then denying their role in doing so, their literal bankrollers are making billions exploiting public outrage over their practices. Meanwhile, the climate may or may not be changing, with or without humans driving it, and no one is genuinely examining it because they are all entangled in this immense racket. That should be a conclusion both sides of the current climate change debate could agree on - one doesn't need to be a scientist to understand the impact on human health car exhaust has on the human body or the immense waste involved in manufacturing plastic trinkets in China, putting them on a ship to steam across oceans to be put onto trucks to be put into a Walmart and sit under lights burning 24 hours a day to be bought by a consumer who drove to the store and now must drive back home. But dismantling immense oil and retail monopolies and replacing them with self-sufficient, high-tech local communities seems to be furthest from the minds of those championing urgent activism in response to climate change. Instead, they propose even more power be put into the hands of governments, banks, and corporations to create "policy." The "policy" to no one's surprise, leaves more power centralized in the hands of the very special interests that are truly and quantifiably destroying the environment. Why aren't people seeking technological rather than political solutions to address climate change? What if we mitigate humanity's impact on the climate, and it still changes, just as it has for hundreds of millions of years before humans walked the Earth? Will "carbon credits" feed us if the world becomes incredibly cold, destroying global agriculture? Will it hold back flood waters if oceans rise despite our greatest efforts? Some how, "science" has convinced people to worry immensely about a problem but do nothing at all practical about it. What is it about rational "science" that has people acting so irrationally? Hiding behind science is nothing new. Darwinists hid behind it to prop up their racism, which in fact inspired the Nazis to hide behind it to scientifically prove they were the "master race." The Nazis, in fact, loved science, and used it with horrible precision. As mentioned before, big-tobacco used "science" to prove their products were perfectly "safe." What precisely has convinced people today that such charades are not still playing out, more refined now than ever? As National Geographic stated, people love their tribes. Those who have circled their wagons around "science" as their chosen dogma, are no different than the religious they believe themselves to be superior to. 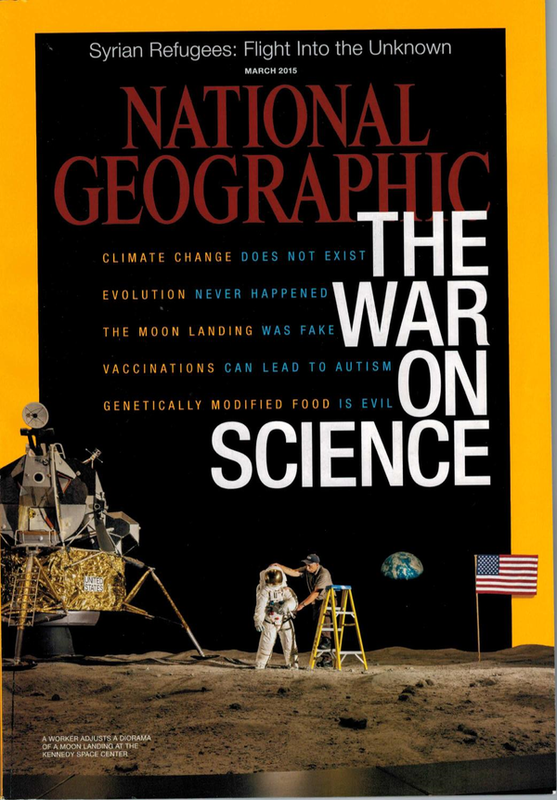 They have not truly and objectively looked into any of the issues they blindly support - and as National Geographic did, simply claim "it's science!" or that "experts said!" The arguments made for GMO, vaccines, and climate change are made by the same circle of special interests and propagated by their immense media monopolies. Little they say can be independently verified by the army of sycophants that eagerly repeat their claims. Citing a "peer reviewed study" is different than reproducing an experiment's results oneself. Also troubling is that following the money to see just how valid or compromised such studies might be seems not to even factor into this tribe's calculus. Their belief that scientists are infallible and incorruptible is as naive as those who believe their respective priest classes are likewise somehow above all others morally, spiritually, and intellectually. National Geographic's article will undoubtedly help reinforce this new, backwards religion of "science," while leaving real science battered, abused, and a stolen shield carried by liars as they carry out misdeeds against others. And while this new religion will swear their "science" is the only answer - all others might hear is yet another and particularly shrill voice amongst many others drowning out the voice of real reason.